Integrated sealing and shrinking in one step. Transparent hood makes the sealing and shrinking visible. Adopts glass fibre cutler's isolator and nickel alloy cutter in order to result in perfect sealing line, to avoid the film sticking the cutter. Special roller with pin to make small holes on the film. Might not make over hot around environment after long time operation. The height of the package supporting mesh inside the chamber can be adjusted for different sizes of products. Established in the year 2007, we "Inpack Machineries India Private Limited" are leading manufacturer and exporter of a wide range of Perfume Machine, Molasses Filling and Packaging Machine, Food Filling and Packaging Machine, Detergent Machine, etc. We provide our products range with high standard and quality to our customers that can meet to the national and international market. 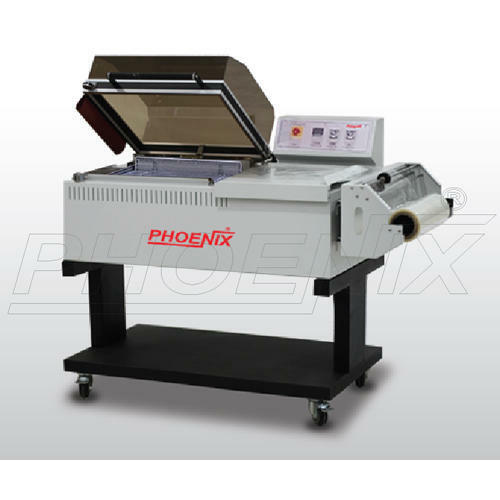 These machines are very much compatible and easy to use having a high speed and high accuracy for the filling line. We guarantee our customers to give the uneatable machines which can prove and upstand to their requirement that fulfills their production capacity in a very short time limit. Our customized machines are specially designed as per accuracy capacity and specifications of the product used for the filling and packing machines.